Piecasso Pizzeria & Lounge, Stowe | Out to Eat | Kids VT - small people, big ideas! It's a given that pizza is going to be a kid-pleasing meal. 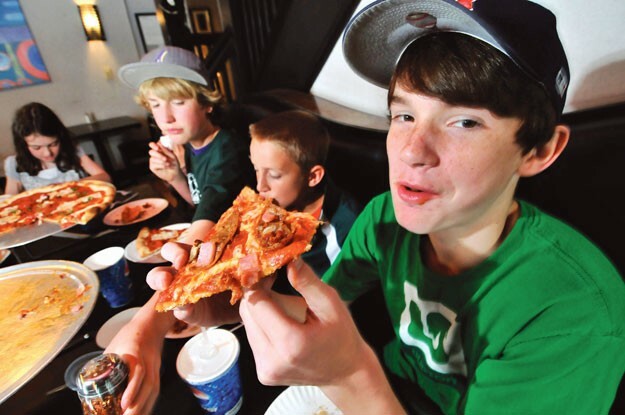 But it's also gotten a lot more interesting for adults in recent years, as Vermont's pizzerias have kept pace with changing tastes in ethinic flavors, added dishes to accommodate special diets and intergrated local ingredients. From Burlington's Leonardo's and Bite Me to the Mad River Valley's American Flatbread to West Glover's Parker Pie Co., creative pizza abounds. When you get a group of passionate pizza lovers in the same room, Stowe's Piecasso Pizzeria & Lounge nearly always comes up. My boyfriend, Greg, and I packed up my sons, Ethan and Zander, and headed to Stowe to check it out. Zander looked worried. "But will they have toys?" he plaintively asked. We told him that was part of what we were going to find out. When we arrived at the Mountain Road location, the hostess immediately apologized and explained they were only serving a limited menu because of ongoing kitchen renovations. A two-sided, photocopied sheet listed sandwiches, salads and pizzas. "No dessert?" I asked. We had promised the boys dessert, and I wanted to be prepared. "No dessert," she apologetically affirmed. We were shown to a table in what is normally a small game room, where two other families with children were already seated. All of the tables were preset with paper plates and flatware rolled in paper napkins. The walls were decorated with art prints, including two by Picasso marking the restrooms. Though the offerings were limited, Piecasso had something for everyone in our group: with gluten-free and vegan options, as well as pizzas named The Tree Hugger, (spinach, basil, tomatoes, garlic and red onion) and Heart Stopper, (red sauce, double cheese, double pepperoni, double sausage). The management obviously knows Vermont's quirky, diverse tastes well. Our waiter, Jared, was glad to bring us crayons once we asked. That, plus a trip outside to visit Pablo Picowso, the restaurant's beret-wearing fiberglass cow, kept us busy until food arrived. Ethan was delighted with his individual 10˝ pineapple and bacon pie ($10, and half of it came home), and Zander had never before had an entire mushroom pizza to himself ($9, with even more left over). Greg chowed down on a Carcass (pizza with red sauce, pepperoni, sausage, ham and meatballs with extra mozzarella), and I had some salad with a side of eggplant parmigiana. It was delicious, but I would have liked the eggplant sliced just a bit thicker, since it was hard to discern inside its crispy coating. After we were done and had leftovers packed up, Jared steered us back to Stowe's Main Street to check out I.C. Scoops for ice cream. It was a nice stop, but we promised ourselves that next time we made the trip, we'd save room for Piecasso's cannoli and Lemony Snicket Cake. And, given how much we enjoyed the food, that's sure to be soon. Cheryl Herrick is a writer and blogger who lives in Burlington with her two young sons. Visit crankycakes.com for more of her adventures in food and mom life. Note: Renovations should be finished by the end of June, resulting in a more efficient kitchen for the cooks and more dining room seating. The full menu includes appetizers such as chicken wings and calamari, pasta entrées, nightly specials, and desserts. Family-friendly amenities: High chairs and booster seats; changing tables in the restrooms; seasonal patio seating, crayons and "draw your own pizza" space on the kids' menu; a fiberglass cow named Pablo Picowso to visit outside while you wait and a game room with video games for older kids and teens. Right across the Mountain Road from the Stowe Recreation path: Work up an appetite first or work off the guilt after. Our bill for four: $65, including tip.